Stop. Take a good look at your life. What and who’s in it? And are you doing (enough of) what you want? Perhaps you’re feeling taken over by modern life’s pressures, others’ demands, and what you think you should be doing. Or do you think doing what you want is selfish? No reason to. Our wants can be positive, constructive ways for us to create a life that suits who we truly are. Time for a quick check? Read on! I have a gorgeous little nephew – he is three-and-a-bit years old. Up to now, he’s been easy going, relaxed, easy to manage and look after for his parents and family – un amore, as we would say in Italian. Pure love! But more recently, he’s discovered his will, and his opinions and preferences. He’s started telling us what he wants, and insisting on it with tears and tantrums. It’s a classic and important stage in child development, of course. And although dealing with tears and tantrums can be stressful, we’re also watching this process with interest: There’s my nephew becoming more of himself. What I want today is certainly different to what I wanted when I was a teenager, or when I was in my thirties. We might feel selfish for wanting what seems ‘too much’ for ourselves. Exhausted from selflessly putting our own wants behind those of other people. Or swayed in following what we want, by what our partner wants, or our friend, or our family, or our boss at work. Do you recognise any of that? We do. We can neglect what we want so much that we forget what it was. And stop believing that it’s important, or should be heeded. This might well lead us to feeling discontent with our lives. It might lower our mood and enjoyment of life, and in extreme cases, it can also make us feel depressed. Nor is it hedonistic, or materialistic, or immature. In fact, getting clear about what we want in the force-field of demands and pressures from others is vital for your psychological and emotional survival and your happiness. It is your first step in taking responsibility and control of yourself and your life. It means exercising your power of choice, and having agency and influence in your own life. So that you feel that the life you live – with its good and its bad stuff – is really yours. And that it’s a life you love. I don’t mean to say you should be ruthless in pursuing what you want, and walking over the metaphorical dead bodies! By all means negotiate your wants with those who are important in your life, and consider the consequences on others. So stick to your guns, and work towards having enough of what you want in your life at any one time. Check out my 7 simple steps for how to do that. Three ways to find out. Enjoy! This is simple but profound: Take a quiet moment, and sit down with two pieces of paper. Make the following two lists. Now compare and contrast them. What do you notice? Have you got enough items on the ‘Do’ list that are also on the ‘Want’ list? Where are the biggest gaps and differences? If that’s too simple for you, try going from..
What’s important to you in life? What values or principles do you want to live by? Make a list, aiming for single words like ‘love’, ‘integrity’, ‘connection’ or ‘freedom’. Then pick your 5 most important ones, and list them in order of importance. How much are you living each one of top 5 values in your life right now? Put an F against those you’re living Fully, an N against those you’re living Not-at-all, and a P against those that you’re living Partly. Are you living enough of what really matters to you? Where are the greatest gaps? Think of your life as it is today, and write down the main activities that take up your time – the things you do a lot of. Now pick out the ten things you spend most of your time on. List them in sequence – with the activity you spend most time on first, and the one you spend least time on last. Or, if you prefer, draw them out in size – biggest one first, smallest one last. Now pick two colours, and paint the chunks of your time you spend on what you do want in one colour, and the chunks of your time you spend on what you don’t want in another. In my chart, let’s say pink is what I don’t want, and lilac what I do want – but what do you see in your chart? How much of your time are you spending on what you do want to do vs. don’t want to do? Are those appropriate and satisfying amounts? So: What did you find out in the checks above? 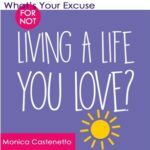 Are you doing (enough of) what you want? Great if you found that you are – keep enjoying it! You might enjoy reading about 10 Key Ingredients of a Life You Love. Check out my blog post on how to gently adjust your life in 7 simple steps. Read my ultimate guide to changing you life, 6 Steps to a Life You Love, for step by step guidance and practical tips on creating a life with more of what you want in it. Get my structured, intuitive and empathetic coaching help. I specialise in working with people who are at crossroads in life and don’t know what they want. And I help them find out what that is, and move into a life they want and love, with more ease than if they were to do it on their own. Take a look at how you can work with me now! So, what thoughts have these quick checks sparked in you? What do you want, and are you doing enough, or not enough of it? I’d love to read your comments, if you care to share! And if you want to work with me to create your change, check out my coaching programmes, or email me at monica@livealifeyoulove.co.uk to book your free, no-obligation Clarity Session. Not doing what you want in life? Here’s how to adjust in 7 simple steps.